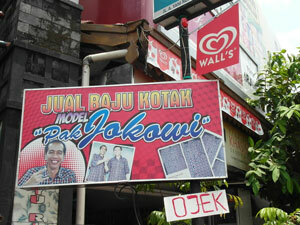 A shop in Solo capitalises on the popularity of Jokowi’s trademark check shirts. Well, it’s official. Over 133 million Indonesians cast their votes peacefully, had them counted repeatedly and now have a new president elect. Congratulations to Indonesians for staying unflustered in the face of Prabowo Subianto’s schoolboy tantrums. Now we’ll see a recap of the “dagang sapi”, the cow trading, that preceded the election. Already, some senior figures in Golkar have begun to mumble about switching allegiance to Jokowi’s coalition. Jokowi has repeatedly said that he’s not going to play at dishing out cabinet posts to secure support (a strategy which has so clearly failed SBY). But if he doesn’t, he may find himself unable to work Indonesia’s Byzantine parliamentary committee system effectively enough to push through the radical reforms that Indonesia so badly needs. An end to the crippling fuel subsidy, for example. A coherent (and feasible) plan to build the infrastructure that Indonesia will need to employ its growing population. For reasons that I discuss at greater length in a recent essay in the Nikkei Asian Review, Jokowi’s plan to reform the bureaucracy will not be universally popular; sinecure jobs in the civil service are just too important a unit of currency in district elections. Indonesia continues to exist because of its extraordinary talent for compromise. It’s inevitable that the future President Jokowi will be forced to compromise on some of the principles dearest to him. He was elected by the Indonesian people, but (like Barak Obama in the United States) he has to work within a political system that is beholden to a very small though perhaps increasingly disparate elite. He won’t be able to rely just on his popularity to carry him through, especially if he really does tackle wasteful subsidies. Jokowi appears to be a methodical man who avoids the sticking-plaster solutions so beloved of elected politicians everywhere. His immediate challenge will be to co-opt or otherwise appease the people who could thwart his plans for reform, without selling out to their agendas. That, of course, includes Prabowo and his supporters. It came across my screen just after Prabowo had thrown his toys out of the cot and flounced out of the counting process. Hmmm, I thought for a nano-second, I didn’t know Masha was interested in Indonesia. Of course she’s talking about that other self-satisfied politician who likes to kidnap activits, Vladimir Putin. I have a lingering question about the election: how many of the 62,576,444 Indonesians who voted for Prabowo would do so again if the election were repeated tomorrow? I believe the General-Until-He-Was-Fired would have many fewer supporters. People chose him because he promised stability; then he set about trying to create chaos. It is a testament to the sangfroid of the Indonesian electorate that it didn’t come to that. Be the first to comment on "Let the cow-trading begin!"